If Your Facebook Friends Are In A Mess What Should You Do? 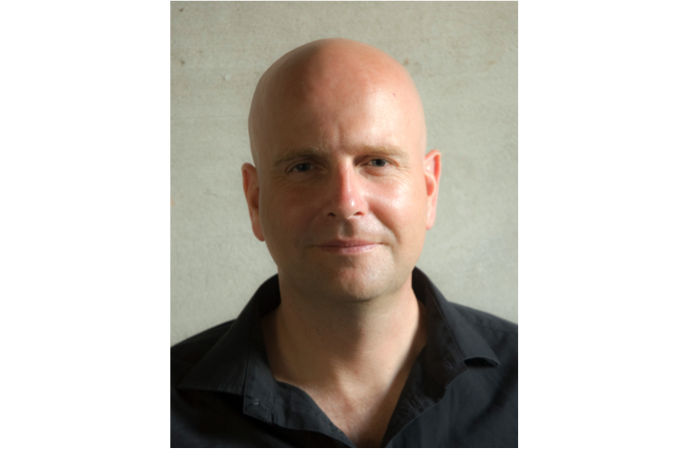 Two weeks ago top Internet Marketer Ed Dale decided to Boot all of his Facebook friends by deleting his Facebook account and starting again from scratch. He raised the question in many people’s minds of whether they should do the same. Ed is kicking out the dead weight from his Facebook profile but its a laborious task. One of Ed Dales buddies Ryan Deiss has asked the question Should I “Unfriend” All My Facebook Friends Like Ed Dale? 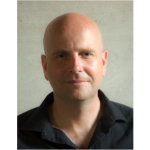 I would like to offer some alternative solutions that can help you manage your Personal and Business profiles under a single Facebook account. The root of Ed Dale’s problem lies in the fact that he is not a normal Facebook user. Facebook will only let you operate a single account that has to be in your own name.This means that your personal and business life has to be all lumped together. Being a famous Internet Marketing Guru means that you get a lot of people wanting to be your friend. John Reese maxed out his Facebook profile in under a week last April reaching the 5000 friend limit. If your network grows so rapidly it’s next to impossible to organize it in any structured way so that it can benefit you. For those who are using Facebook for business purposes there are some lessons to be learned here. Without quality control, structuring and proper organization your network could turn into a sticky mess. Facebook are considering raising this limit but the question is, how can you manage a huge network of friends and still be able to use Facebook like a normal user? Ed has been missing out on the way most normal people use Facebook and because the intensity of the background noise gets too much to cope with he opted for the drastic approach….Starting Again!! 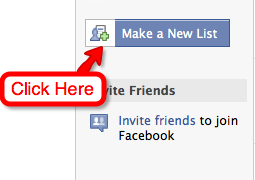 This is one of the most powerful and under used functions on Facebook that you need to get into the habit of using. By creating segregated lists you can keep track of specific groups of friends and keep all your business contacts in one place. The best way to implement this strategy is to build it into your regular routine when you send or receive friend requests. Choosing logical categories will help you find them later and make you more likely to use this function on a regular basis. Your friends can belong to multiple lists but don’t add too many categories as it defeats the purpose of the exercise. 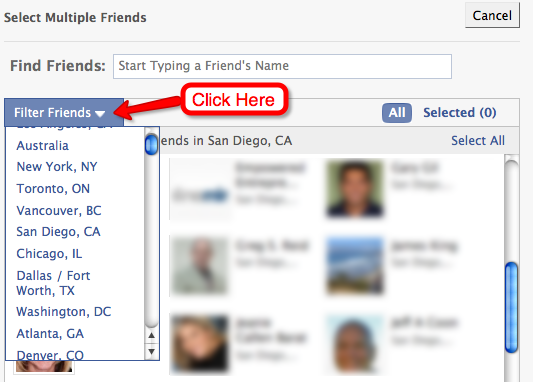 You now get the option to start typing in the names of the friends that you want to include in your list. Often its difficult to remember everyone’s name and its very easy to forget people once they become buried in your contacts list. 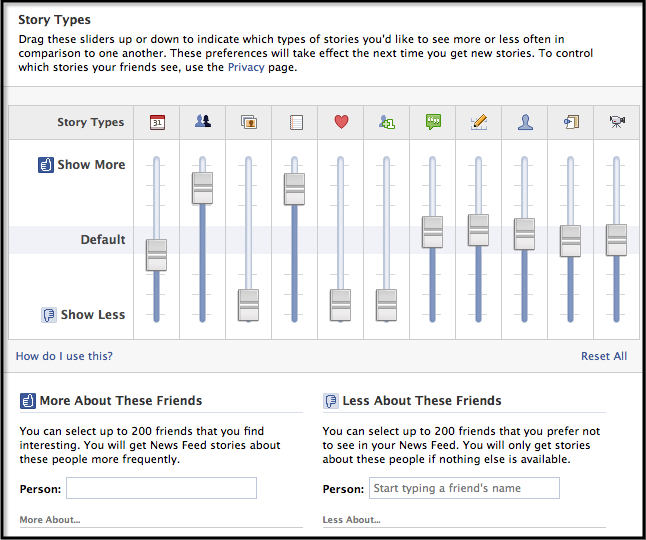 You have a second option and that is to click on SELECT MULTIPLE FRIENDS, this will pull in the photographs of your friends. If you have a big network this might take a while to load so be patient. Another very powerful option is to filter your friends by region, when the MULTIPLE FRIENDS option is open, just click on the FILTER FRIENDS tab and select who you want to include. Of course you will only be able to find your friends who have entered all their details correctly. Now when you make a friend request or add a new friend you will have the option to place that person into one or several of your chosen categories, Just click on the small triangle in the corner and your lists will be shown in a drop down menu. Get into the habit of doing this and you will build a much more powerful and easy to manage contacts list than the jumbled mess you might find yourself in otherwise. It becomes more important the larger your network grows; once you get over 500 friends it starts to become an issue and the job of segregation becomes harder and harder. It’s never too late to start, so take my advice and keep organized. If you are planning on sending messages to a list you need to keep it below 19 members. Remember to warn people that if they respond, their reply will be sent to everyone in the group. This type of messaging is best done with the permission of your friends, as it can be very annoying if a recipient isn’t interested in the message and they get bombarded with all your personal replies in their email inbox. 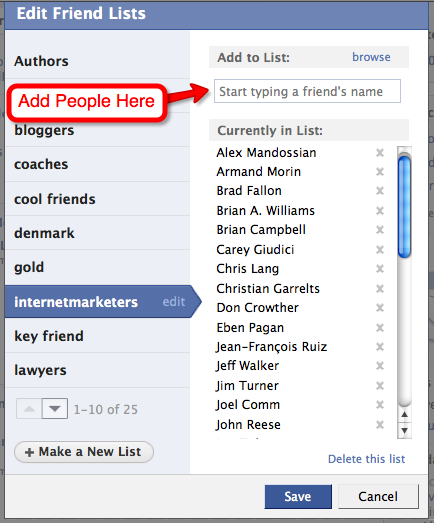 If you want to message more than 19 people at a time consider making multiple lists or try starting your own Facebook group. 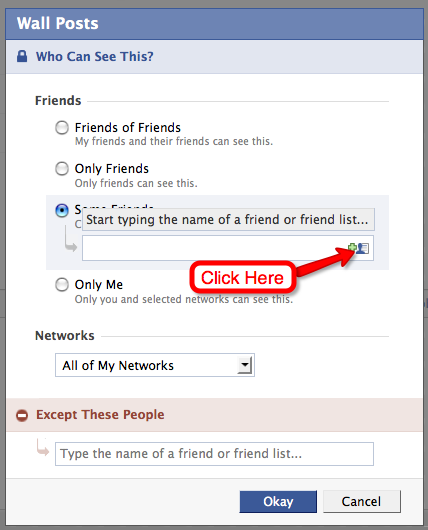 For personal friends you can keep this group secret and it will be invisible to other Facebook users. 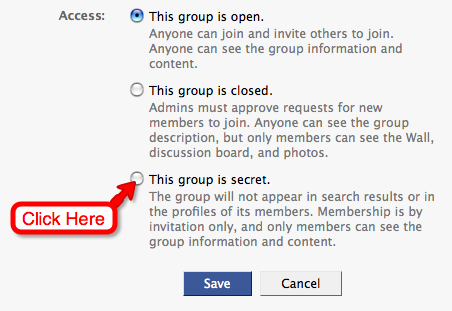 You can adjust a group’s privacy settings when you create the group. First click on the HOME tab on your profile page this will take you to your usual newsfeed page, there are 6 tabs for you to select what type of news you want to see. To view the newsfeed of one of your segregated friend lists click on the TRIANGLE tab that says MORE FEEDS and scroll down the drop down menu and select the one you want. For those of you who like to spy on your competition this is a great way to track other peoples Facebook activities and see what they are up to. If like Ed dale you want to keep track of your friends and family then this would be the best way to go about it. Another way you can add people to your lists is by clicking on the EDIT button in the MORE FEEDS tab and then entering names in the box provided. When you click BROWSE you have a rapidly scrolling list of your friends. You don’t get any photos when you do it this way so it loads a lot faster than the other options that you can use. You can populate a list quickly and easily if you know who you are looking for, the list is presented in alphabetical order. You are then faced with a set of sliders, much like you would find on a graphic equalizer. Just adjust them to the type of news you want to receive and add the names of all the people you would like to hear more about. 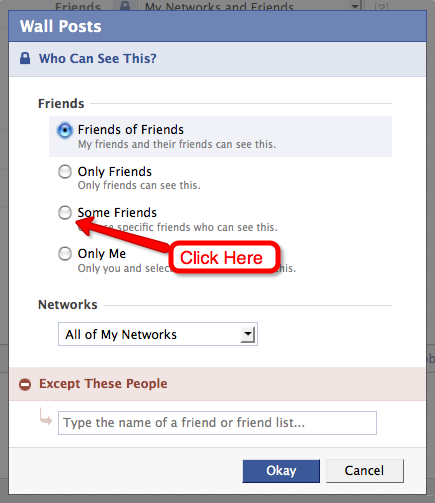 If there is a particular person who shows up constantly in your newsfeed with news that doesn’t interest you and you don’t want to remove them as a friend you can place their name in the second box on the right and hopefully they will become less visible in your newsfeed. Facebook have a function, hidden deep in the privacy settings that allows you to choose who has access to your wall and who you will allow to see what others have posted. By using your friends lists you can keep your personal friends or business contacts in their own little bubble depending on which way you choose to adjust your settings. 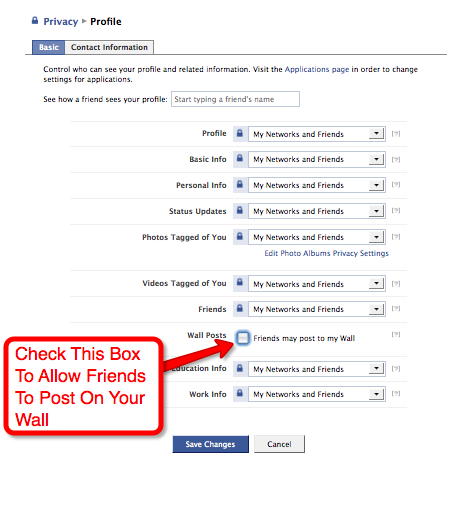 From your profile page, first click on SETTINGS and then click on PROFILE, this will take you to the privacy>profile settings, scroll down and select the box that allows friends to post to your wall. If you are suffering from a lot of wall spam or you don’t feel comfortable with others posting on your wall keep it turned off. If you want to customize who can interact with your wall then you can use your lists and only allow certain groups of friends access. 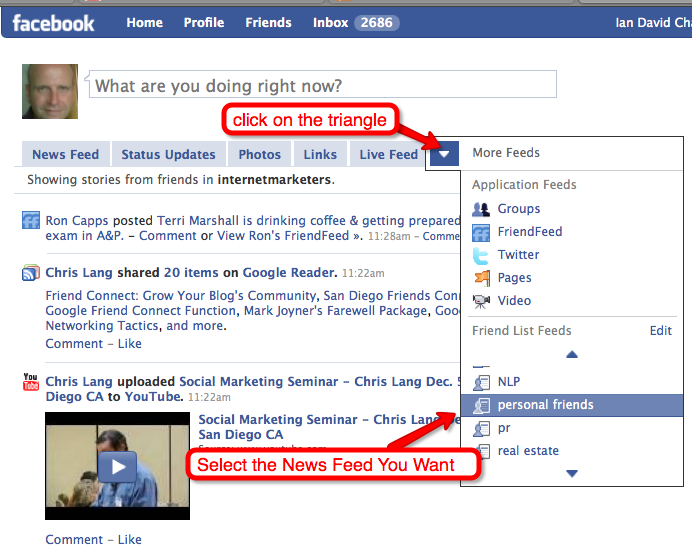 click on the triangle and select CUSTOMIZE from the drop down menu. A new pop up screen will now appear. Now you need to select which networks you want to be able to see your wall. 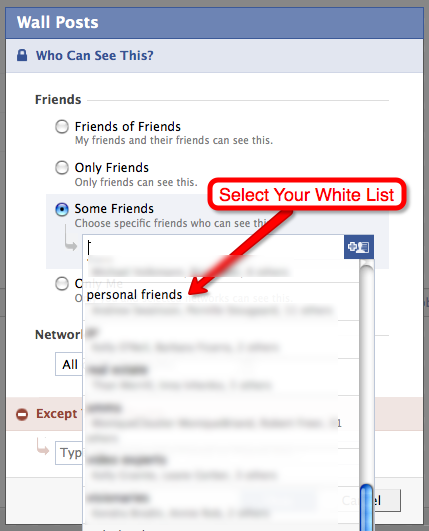 If you select NONE OF MY NETWORKS then only those on your white list will be able to see your wall. It’s a good idea when experimenting with these settings to have a friend on another computer check how your settings affect them. You might not want your boss or work colleagues seeing every aspect of your social and family life. The bottom line whether you are using Facebook for personal or professional interactions is the more you understand how the platform works and the more organized and disciplined you are regarding how you separate your personal and private life. The more pleasure you will gain from using it. In my opinion it’s the most powerfull social networking platform ever created, if you have any further suggestions or ideas about how to integrate your personal and business contacts please feel free to leave a comment. One thing to keep in mind when deciding to whitelist or blacklist is that blacklisting takes priority over whitelisting. Anyone familiar with security settings of any kind will be aware of this but it may surprise some users. For example, suppose you set your wall to be visible to two groups (A and B) and then choose “Except” group C. In this case anyone in groups A and C will not be able to see your wall. This is a nice and secure way to set things. To ensure a friend can’t see your wall, simply put them in group C.
Now suppose you have it set so that your wall is visible to A and B with no exceptions. Keeping wall posts hidden from group C now requires you don’t put them in group A or B. Which one you choose depends on how many friends you might have in more than one of the related groups. In my mind scenario one is the most secure but I prefer to set up scenario two because I have a several friends who fall into groups A (Family) and C (Professional) and I always know I will sort them properly. My example is intentionally simplified. There are many ways this might surprise you. I really wish there was a way to keep two groups totally segregated from each other in the general homepage flow — where I could post “what I’m doing” specifically to each of 2 groups of friend, and their comments would only be seen by members of the particular group. This would really allow me to keep “business/professional/networking” and “pleasure/friends/old-school-chums” nicely separated. As it is now, I just don’t feel comfortable letting old school friends comments blend in with the folks I’m “friends” with professionally. I don’t think Wall segregation is enough, unfortunately. I think Facebook are moving in the right direction with the new functions of Facebook Pages, at some point they will realize that for many people mixing their business friends and personal friends is inconvenient and allow a Business page to have the same powers as a personal profile. I decided against setting up strict filters on my wall for several reasons. Firstly without two accounts you can’t accurately check if your filters are working correctly and secondly because Facebook often makes mistakes and has bugs and glitches. Several times I have had to reset my personal settings. Hi, I have friends that I would like to add to my friends list but that are not friends with some of my other friends. If some knew that I had a relationship with the others, I think that they would be very upset. I wonder if there is a way to keep certain friends from seeing certain other friends on my list or from seeing any posts they make. I found the way to privatize the posts but I would like it to remain completely unknown. how can i “hide” my news from going into newsfeed of certain ppl on my list? Could you please send me your Facebook Stategies Guide. If you sell with a merchant account, take a look at my free articles on my website. Hi Ian – Where are all these options, I tried finding the feed segregation by groups and the graphic equalizer and none of them I am able to find ….are there different views that you use …I will still keep looking but would love to know how you access all of this..and yes my biggest ask is that we have tabs we can customize for feed…professional , personal family, and causes and groups – keeping the wall cleaner – right now its a mess!! Love to hear form you ..cheers! justification seemed to be at the internet the simplest thing to consider of. time as other people think about worries that they just do not recognise about.